Gender Bias is a discrimination that often goes unnoticed on a day to day basis. This Bias has been push through each generation from early history when all women would stay at home to care for the family and house while the man went to work to provide the income for the family. For history to have a period of time like that creates a bunch of stereotypes for what boy and girl should be and act like from an early age. It was up until the nineteenth century when women were allowed to partake social life, education, and politics. These ideas where pushed through movements like Christianity and the age of enlightenment. It has taken women movements and acts from the government for women to be respected by institutions of the government. Although women are still fighting to this present day to still have equality between men and women. Our history allows us to see there has always been separation of fair equality between men and women. Overall both of these links below talk about gender bias in different and similar ways but both educate you on gender bias in the world today. They both also touch on how gender bias has progressed over the years and through movements. Cannabidiol—CBD is a chemical compound in cannabis that is beneficial from a medical standpoint. It gives people the medical benefits of cannabis, without getting the “high” or “stoned” feeling. CBD is still paving way for acceptance but has still has a stigma since it derives from the marijuana plant. There has been tons of testing done on the benefits of CBD especially when we talk about seizures and general body inflammation. The major break through right now with Minnesota Medical Solutions is that they have developed a more potent strain of marijuana to extract CBD from. This is a vital procedure because it cuts production costs by making it easier to produce the plants, and making it cheaper to refine CDB from. Since Minnesota is one of the most restrictive states with medical marijuana it is a great opportunity to get rid of another obstacle standing in the way of patients in need of medicine that isn’t as harsh, and providing an alternative solution to their medical needs. From my point of view on CBD, if there is a medical solution with out experiencing the intoxicating aspects of marijuana it should be used medically. It has very minimal or close to none side effects and can help a large sum of our population. Obviously we still have a long journey on the way to legalization on both state and federal levels, but having medical CBD available is a step closer to legalization. I will present two blogs that I have been following for more than a month. The Sleep Number Blog stated that it was the Official Founding Partner for the Super bowl NFL season and dedicated last week’s articles to how athletes need a restful sleep and what kind of sleep number settings helped them achieve maximum rest. They also communicated their Sleep Number Station with full-on activation at Nicollet Mall and engaged the public who came to visit and sleep on their Sleep Number Setting beds. an Art, and a biological rhythm of everyday living. The blog subtly promotes the Sleep Number beds but not in an overtly in your face marketing campaign. It talks convincingly about the Sleep Number bed and how it can help you stay healthy through life’s ups and downs. I like to read this blog because they have a Book Club and showcase interesting books to read. This scores maximum brownie points for me along with other well-written articles. It has a subscription list as all blogs and also has shareable content. I liked the blog because it covers almost all aspects of sleep and has an authentic voice and a delightful online presence. The second blog that I loved is the Minnesota Math and Reading Corps blog. It is a simple blog with no fashionable art or sophistication. It speaks out to me, because serving in Reading Corps for four years was significant milestone in my life. It also salutes those who have served and currently serving. It is a blog of service to young children and how each member has his/her own story of triumph. (https://blog.mnreadingandmathcorps.org/2016/05/learning-and-growing-together.html?view=snapshot) That is me and my 2 minutes of Reading Corps glory. This blog places it’s focus entirely on the Tutors without any distraction or deviation. You may ask why is this so? It is because the Tutors are the ambassadors of the Program. The Program has its independent website which has all details of the application process to become a Tutor and the works. The blog is completely dedicated to the individuals who bring the program to life. These tutors come from diverse backgrounds, but with one mission: To make a difference in the lives of children. The blog does an excellent job of delivering it in a direct and powerful manner. In my analysis of the two blogs, I think they are creative hubs or online stations where the brand experience is communicated in a singular strategy. The Sleep Number Blog talks about the multifaceted phenomenon of “Sleep” and the Minnesota Reading Corps Blog talks about “Tutoring as a lifetime experience”. The blog is available to a global community and you can reap the benefits of learning more about sleep patterns or the joys of being a tutor simultaneously. It is incredible how blogs are changing the way we experience life through the eyes of other’s who are sharing their experience and information. If you stop and ask a college student if they’ve ever pulled an “all-nighter” to study for a test, or to write that last minute paper the response is likely, “Yes”. I know during the years I’ve been in school I’ve sacrificed a lot of sleep due to my procrastination and poor study habits. The relationship college students have with sleep is something that needs to be improved in the years to come. According to Shelley Hershner and Ronald Chervin 50% of all college students report daytime sleepiness and 70% report they attain insufficient sleep. Those numbers are quite high, but not shocking to most. The lack of sleep for college students attribute to lower grade point averages, higher rates of car accidents, and possible failure of college classes. Not only do GPAs and academic success hinge on the amount of sleep a college student gets, but the lack of sleep also attributes to altered, negative moods. One reason college students attain insufficient sleep is simply because there is so much going on around college campuses. Both academically and socially, students can be overwhelmed with the prioritization of their needs. Living in a college dorm is a blessing and a curse. Each pair of roommates have a different schedule and a different set of priorities. As the years go on, it seems as though self-care and wellness seem to go by the wayside. To fix this problem, the path is a two-way street. Universities need to adjust policies and engage in campus outreach to spread the message that sleep is exceptionally important to a student’s academic success. Also, students need to realize how much of their success hinges on getting the appropriate amount of sleep. Is Sleep Deprivation The New Norm? In their other articles, they touch upon various aspects of life that deeply relates to have a sound sleep. It can be as simple as a bedtime routine, to cutting out caffeine, to eating the right kind of food, to decorating your bedroom to make it look comforting. Or it can be as complex as Sleep program accreditations and assessments which are scientifically proven. The blog does a thorough job of investigating all aspects of Sleep as a Science, an Art, and a biological rhythm of everyday living. The blog subtly promotes the Sleep Number beds but not in an overtly in your face marketing campaign. It talks convincingly about the Sleep Number bed and how it can help you stay healthy through life’s ups and downs. I like to read this blog because they have a Book Club and showcase interesting books to read. This scores maximum brownie points for me along with other well-written articles. (https://blog.mnreadingandmathcorps.org/2016/05/learning-and-growing-together.html?view=snapshot) That is me and my 2 minutes of Reading Corps glory. This blog places it’s focus entirely on the Tutors without any distraction or deviation. You may ask why is this so? It is because the Tutors are the ambassadors of the Program. The Program has its independent website which has all details of the application process to become a Tutor and the works. The blog is completely dedicated to the individuals who bring the program to life. These tutors come from diverse backgrounds, but with one mission: To make a difference in the lives of children. The blog does an excellent job of delivering it in a direct and powerful manner. The blog is available to a global community and I can reap the benefits of learning more about sleep patterns or the joys of being a tutor simultaneously. It is incredible how blogs are changing the way we experience life through the eyes of other’s who are sharing their experience and information. When was the last time you woke up feeling refreshed and well rested since becoming a college student? It’s not typical when we have many classes, assignment deadlines, group projects, and class discussions that we try to cram at 11:59 pm. No one said that college was going to be easy, but who thought it was going to be this difficult getting eight hours of good sleep at night—I’m lucky if I get six! So, let’s get some great night time sleep and pass our classes well-rested. If you want to get more tips and advice on how you can get more sleep at night, the articles below have some wonderful pointers. Even though we know something is inherently wrong why do we continue to do these things? Finding a cohesive resolution for dealing with humans negative affects on the environment can leave many feeling overwhelmed and unmotivated to take action since the scope is vast. We’ve all seen videos of Arctic ice melting around a baby polar bear left to its demise. We know that this is a result of global warming and that all of those consequences are due to human’s disregard for the environment. Constantly showing people the penalties of their actions often times desensitizes their abilities to see past the issue which in turn will hamper their ability to even begin to deal with resolutions. We must modify the narrative by displaying opportunities for people to take responsibility with simple solutions they can adopt in their daily life. Teaching a dog a new trick through punishment of a whip will leave behind a battered spirit afraid to show affection. Take the same dog and apply a different method involving an incentive such as a treat and you’ll get the same results and an ally for life. Let’s use this in relation to how we speak to people about changing their ways on how they interact with environmental issues to encourage motivation not fear. The United States Environmental Protection Agency coined a motto “ reduce, reuse, and recycle”. This slogan has created a movement that promotes individuals gaining knowledge on how they can take action with simple solutions to help them, their community and the environment by saving money, energy and natural resources. Do Meatless Monday, you can save 2,400 gallons of water, which would save more water than you can by not showering for six months. Reusing clothing instead of trashing last season’s threads will not only save you money but you’d be happy to know your not supporting an industry that uses 16% of the world’s pesticides. Recycling food waste by using left over scraps to fertilize your garden not only cuts down on your trash bill but also can reduce your carbon footprint and give life to your plants. There’s a ton of ways that one can alter their day in a positive way to contribute to healing humans stamp on Mother Nature. With the preceding examples I aspire to suggest an alternate to the punishment versus reward method to reframe our approach to how we solicit responses to environmental issues through narratives. Simple actions individuals make can lead to a snowball effect of others adopting the same habits, which can create a vessel for a socially conscious movement towards legislation and regulations supporting environmental healing. To elicit change one must sacrifice the comforts of their privileges. Your individual action directly affects industries that are notoriously costly to the environment. Consumer choices will drive the market in a different direction, which in turn makes companies change their products to ensure they’re meeting the demands of their consumers. Ask for what is right by putting your money where your mouth is and become a Mindful Consumer. I think it’s fair to say that the above meme expresses a universal feeling. At least one time or another, if not every single sunday, of every single week, we’ve all felt this exact feeling. 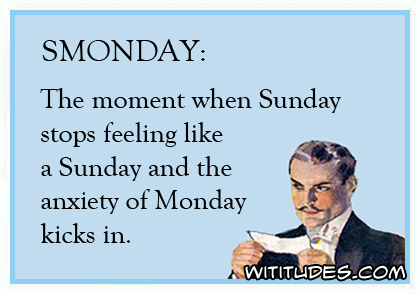 And I don’t know about you, but some smonday’s, it can get pretty dark and depressing. Life is hard enough. The last thing we should be doing is creating anxiety, negative thoughts about things that haven’t even happened yet. We as humans are wired to worry about what has already happened to us and what has yet to happen to us, instead of living in the N O W. It’s time. Let’s focus on the now, while we prepare the what is to come. Sunday is coming in 2 days. Are you going to take control of the day or are you going to let the day control you? Pets aren’t just our best friends, they are also very beneficial to our health. After just returning from a week-long ski trip, the one I found myself missing the most was my dog, Gunner. And with what seems to be a recent “trend” of ESA’s (emotional support animals), I wished I could have taken Gunner with me when I noticed a lady with a cat on the plane on my trip back home. Unfortunately, another passenger had to move seats due to her allergies. This caused me to think, where do we draw the line? Can any animal be a support animal? It’s definitely not news that animal companionship provides many emotional benefits to humans. The bond between humans and animals has been proven to reduce depression and anxiety in humans. Caring for an animal can give people a greater sense of purpose and reduce loneliness, especially for the elderly. The American Heart Association has also linked pet ownership to reduced risk for heart attack. Companion animals most often are dogs, but cats and other pets can be companion animals, also, as long as a person has a verifiable physical, emotional or mental disability and a medical professional has determined this to be true, as well as that the animal is in fact beneficial to this condition. Gunner won’t be going on a ski trip with me anytime soon, but I still consider him my emotional support friend (Gunner featured in photo above). Restorative justice takes a different approach to justice. Instead of the traditional “do the crime, do the time” approach they want to bring one thing that is not often seen is sentencing, forgiveness. I first found out about restorative justice in 2013 with a case from Florida. Conor McBride was dating Ann Grosmaire and had been arguing for two days straight, but it ended with McBride shooting Grosmaire point blank in the face while she was on her knees. It was a tragic end to the life of Grosmaire but also for McBride who ended up driving to the police station and turned himself in. McBride had become apart of the Grosmaire family. He lived there on occasions when he wasn’t getting along with his parents so it was a hard thing to come to grips with for Ann’s parents. While on her death bed, Ann’s father allegedly told him to forgive Conor. While that seemed preposterous at the time, Ann’s father started to think of her words and think of his faith. It wasn’t an easy decision to make but Ann’s parents did forgive Conor, but also found out about restorative justice and how it takes in to consideration the offenders accountability and if the families of the victims, or the victims themselves, are willing to have a civil face to face it will be arranged and possibly taken in for their sentence. While this is rare for a murder case, they are often used in misdemeanor offenses. I feel like this would be a great thing to do. In the New York Times article they do say that offenders are less likely to reoffend when offered this program. Being able to be face to face with the person you hurt gives a human emotion to the crime, and because most crimes are “faceless” looking your victims in the face can really have an impact on the criminals.